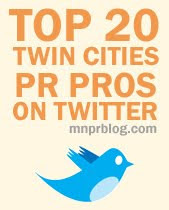 Minnesota PRSA is now offering a new way to save on MN PRSA chapter events throughout 2013. The NEW MN PRSA Event Pass allows members to purchase an event pass for either 5 or 10 events at a discounted rate. This year, the chapter is thrilled to host a wide range of events with industry leaders. Currently, 13 events have been planned (including 2 free networking events). · Gold Event Pass (10 events) for $125 ($12.50 per event) BEST VALUE! o No need to fill out multiple expense reports anymore - just one and done!